Our one year plan for 2016/17 had a series of targets set by the Minister for the Economy, focused on supporting businesses to create new jobs, invest in R&D and skills, and grow exports. I am pleased to report that we have delivered on these. In delivering these outcomes we made over 3,600 offers of support to businesses and universities across Northern Ireland. Our support continues to deliver real benefit and impact to the Northern Ireland economy, with £660 million invested in our economy and 5,900 jobs created in 2016/17 across a broad range of sectors including agri-food, digital and creative technologies and advanced engineering and manufacturing. This year we saw a phenomenal commitment by companies to innovate and invest in research and development. Combined with our support this will see over £206 million invested in R&D and wider innovation . This is significantly over our target of £100-170m as a result of a number of large R&D projects yet to be announced. Investment in skills is another area where businesses can help ensure they remain competitive. This year our support has helped secure £31 million in skills development against a target of £30-40 million. Our suite of equity and debt funds continues to provide a vital source of investment and finance to businesses of all sizes, almost £28 million of finance has been made available this year, supporting 180 businesses achieve their growth plans. A breakdown of our support is available by District Council Area and Parliamentary Constituency area. To access the Invest NI support (PDF) for a council click on the specific region of the map you are interested in. You can view the Invest NI Support (PDF) for a council area by clicking on the region you are interested in below. 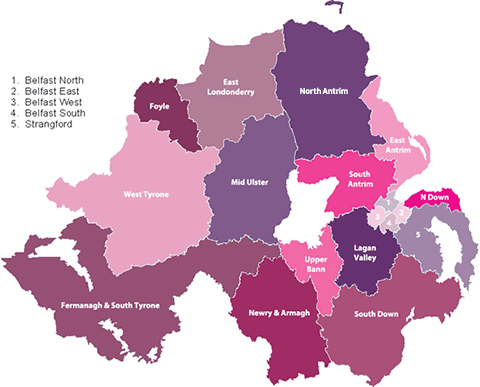 To access the Invest NI Support (PDF) for a parliamentary constituency click on the specific region of the map you are interested in. You can also view the Invest NI Support (PDF) for a parliamentary constituency by clicking on the region you are interested in below. You can view the Invest NI Support (PDF) for a parliamentary constituency area by clicking on the region you are interested in below. Information correct as of 01 April 2017.